When I first arrived at Innis Point at the start of the banding season, one of the first wildflowers I noticed were these brightly-coloured yellow ones. They reminded me an awful lot of the spurge that I had growing in my garden, even if the shape wasn’t quite right. They were growing in pockets here and there of one or two or four individuals. 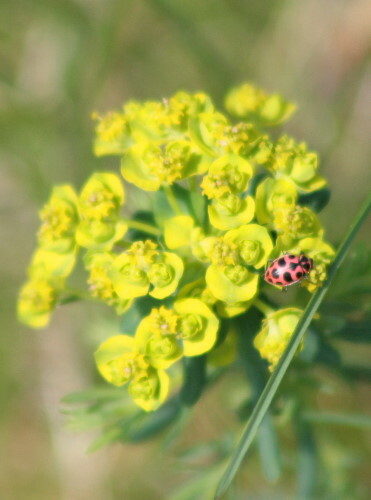 On one lovely warm sunny afternoon I saw quite a few with native ladybugs on them. I was quite taken with them, because they were somewhat unusual and showy. In looking them up once I was home, it turns out I wasn’t far off in thinking they seemed like my garden spurge. 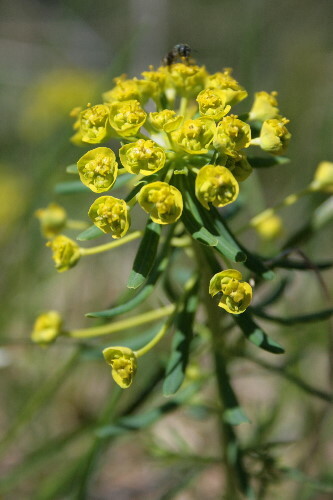 They’re Leafy Spurge, Euphorbia esula, so are from the same genus. These ones happen to be an introduced species, however, first found in Ontario in 1889. Over the last century they’ve spread very well. Their seed capsules explode the same way we might think of those of touch-me-nots doing, flinging seeds up to 5 meters/yards away. Seeds growing near water also float and can be distributed that way. Broken roots can develop into new plants. They’re very prolific. As most well-established introduced species that populate our roadsides and disturbed areas seem to be. I didn’t try picking any, and it seems that it was just as well: the sap can apparently cause chemical burns to sensitive skin, and even cause blindness if you get it in your eyes. Leaves bundled up with hay that start to decay, or decayed leaves eaten by animals among their natural forage in the field, can be poisonous. Ironically, the genus name Euphorbia is taken from the name Euphorbus, physician to King Juba II of Numidia some two thousand years ago. He apparently used a plant of this genus as an herbal remedy, once to cure the king’s stomachache. I regularly do battle with cypress spurge in my garden, and I can testify to the unpleasantness of spurge sap. I think I’ll leave this one out of my yard; Fergus eats fiddleheads and dandelion buds — wouldn’t want him to get his jaws on this. Wow! I was noticing this too at Innis – wonderful to read more about it!